The Lladro (Lladró) story began in 1953 when three brothers used their bare hands to create the beginning of a now large scale Spanish porcelain company. Brothers; Juan, Jose, and Vicente Lladro had a passion for art and were first inspired by European manufacturers of Meissen. This inspiration led them to create plates, vases and ceramic figurines. Situated in Almácera, Spain the brothers worked on their handcrafted creations for almost seven years before opening their first shop in Valencia. In today’s society, Lladro pieces are highly sought after by collectors. Amongst the most valuable are ‘biblical scenes’, the ‘Don Quixote’ series and ‘wedding related’ ornaments to name just a few. All Lladro pieces created after 1971 are marked with a distinctive logo. An artistic flower, representing the region of Spain and mother of clay sits above the company name. Amongst the most valuable Lladro works of art, there are similarities. Pieces that are worth more are generally those that were not mass produced and were some of the earliest pieces created by the company. Some of the most valuable pieces were sold originally to members only. Due to the low number of members when Lladro first came to be, these pieces are rare in today’s society making them worth hundreds to thousands of dollars. Significant events in history created into Lladro pieces are also the most valuable in today’s society. 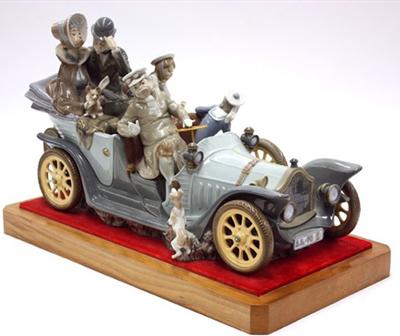 At 22 inches long, “Antique Car” was one of Lladro’s first sculptures. This sculpture first retailed for $1000 in 1971 and is now one of the most valuable Lladro pieces. Around the world, only 750 of these sculptures exist making them extremely valuable and hard to come across. This piece is 22 inches long and shows a family out for a drive in their antique car. 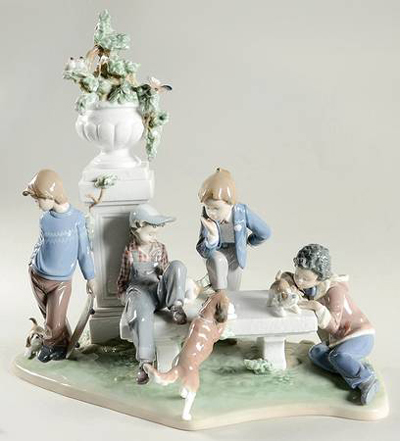 An earlier design of the ‘Fox Hunt’ is this carefully designed, porcelain glazed finish ornament. 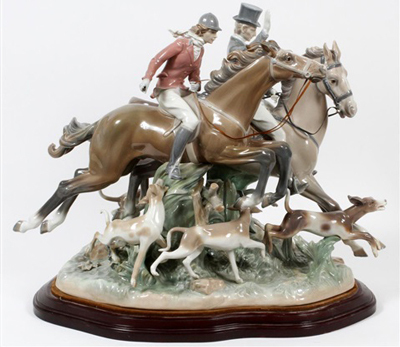 ‘The Hunt’ was an early piece by Lladro, released in 1974 for a hefty price of $3750. This piece was only produced 750 times, which took the company 10 years to fully sell out of. Two men on horses surrounded by hunting dogs are depicted, with every inch of their bodies painted with fine detail. This piece is now worth more than double it’s original price. A very valuable piece created by the Lladro company during 1994. This ornament has fine attention to detail including gold plated horse reins. One of the largest pieces created measuring 42.5 inches long. 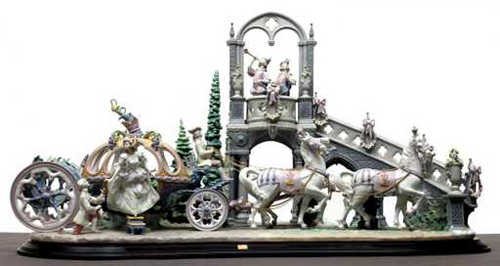 This piece of art depicts the typical Cinderella story showing the carriage, to the stairs along with the prince. Only 1500 ‘Cinderella’s Arrivals’ were ever produced. This Lladro piece holds the title of the most valuable piece from all of the collections. ‘A Grand Adventure’ was created in 2002, with only 500 ever being available for purchase. This piece is not only grand in value but also in size measuring over 53 inches in length. This piece took Lladro artists seven whole years to create and includes 14 different characters. ‘A Grand Adventure’ depicts a train station set in the 19th century. Every inch of this ornament tells a story from the train driver to the excitable children to the little dog. A very intricate scene that shows the characters excitement to board a grand adventure. Another large and extravagant sculpture by the Lladro’s company measuring 44.5 inches long. The ‘XVIIIth Century Coach’ sculpture is a limited edition piece with only 500 ever being released. This piece shows an original 1700’s carriage led by four intricately decorated horses. The 18th Century Coach is now part of a permanent Lladro collection. Original pieces retailed at $14, 000 showing just how much their value has increased over the past twenty so years. 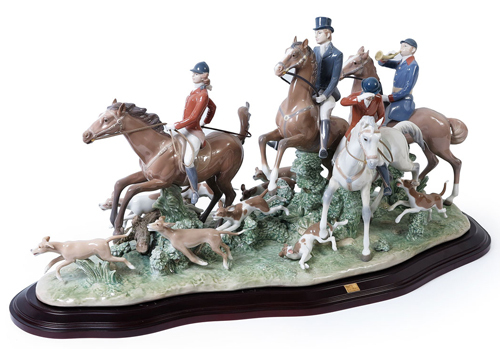 An intricate piece that displays men on horses and dogs attempting to hunt down a fox. This sculpture was created in 1986 with only 1000 individual pieces ever created. This large ornament alone would take up an entire shelf, measuring 33.5 inches long. Crafted with fine porcelain and handmade in Spain this piece has steadily increased in value over the past decade. 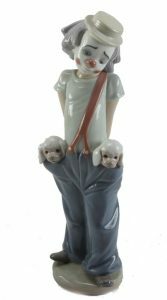 An unusual piece of a clown with a poodle puppy in each pocket. This simple figurine was not a limited edition piece although was one of the first single figurines produced by the company. ‘Little Pals’ was only sold by the company for one year making it a popular collectors item in today’s society. Released during 1989 and sold up until 2004, ‘Puppy Dog Tails’ includes four young children resting on a stone bench and three of their puppy dogs. This is a medium sized piece measuring just over 16 inches long with a glazed finish. 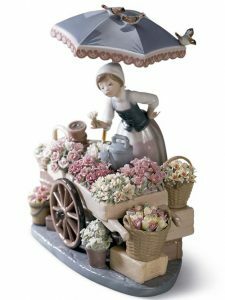 Originally sold for just over $1400, ‘Flowers of the Season’ was one of the Lladro company’s most popular pieces. The detail of this piece is in each and every flower and the detail of the girl. This porcelain ornament depicts innocence and natural beauty. This piece stands just over 11 inches tall and was not classed as a limited edition item. 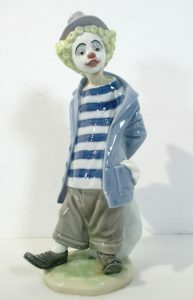 Standing 9 inches tall, the ‘Little Traveler’ depicts a clown with oversized shoes, a striped shirt, top hat and jacket. These pieces are not valuable in terms of price but more so the fact that they are interesting and often hard to come by. They were amongst the earliest figurine pieces making them worth keeping. For more information on Lladro pricing, visit our complete price guide.